Visit Google Family Safety Center – Bookmark It! – Media! Tech! Parenting! 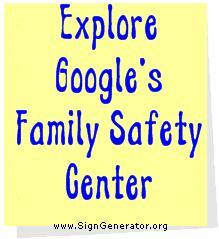 Visit Google Family Safety Center – Bookmark It! Comprehensive web-based resources on digital safety, cyber-bullying, media literacy, and general technology information can help parents learn more about the web and how their children use it. Most of these sites update their content daily with timely tips, strategies for parents and kids, blog postings, and other helpful links. Yet, with so many sites to choose from, parents may have difficulty keeping track of any single location, let alone navigating among the sites on a regular basis. Now Google, as so often happens, has come up with a terrific solution — the Family Safety Center. The center is well laid out with clear explanations about safety tools and connections to many of the best digital and media safety sites — all partnering with Google. Additional safety center resources include a video safety channel on YouTube, currently featuring video tips from parents who work at Google. This channel may evolve into an impressive tool that helps parents maintain privacy while considering and comparing the views of other parents. Yet another link takes users to Google’s abuse reporting page where anyone can leave information about inappropriate or threatening content. Below I’ve posted links to many of the Google partners. Better yet, bookmark the partners page at the Google Family Safety Center and visit periodically to explore the sites. Next Post Quick and Easy Graphing Site – Bookmark It!